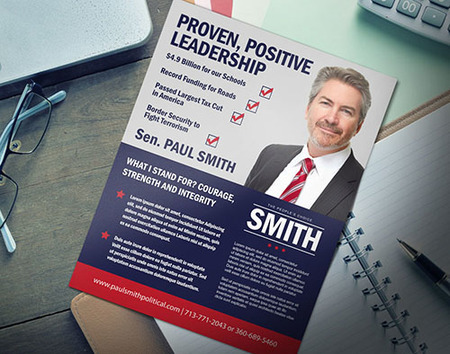 Send the right message with mailable political brochure printing. Brochures sent through direct mail have long been a favorite tool for political campaigns. Political brochures printing is now even more versatile thanks to the wide range of options offered through PrintPlace.com. Match your brochures to any message with standard and custom sizes and 7 different stock options. 10 different folding options make it simple to organize the most complex messages into easy-to-digest sections. Optional scoring can also be done to your folded brochures to prevent unsightly cracking at the folds. Need a better way to organize your content? Perforation, and tabbing options allow you to neatly collate your content and create reply mail. Same day turnaround times and large order quantities also let you have the brochures you want, right when you need them. To print political brochures or any custom order, give us a call or fill out our custom order form. Use our brochure layout templates to ensure your artwork is sized and formatted correctly. PrintPlace.com layout templates can be downloaded for each standard size below, in PDF, AI, ID, PSD, JPG, and PUB format for Illustrator or Photoshop. In a day and age where digital marketing has become the norm for many political campaigns, people still need the human touch. Campaign managers and consultants use these versatile prints both as hand-outs and as direct mail materials. Regardless of the delivery method, campaign brochures allow a much deeper connection compared with their digital counterparts. Multiple studies point to brochures and other direct mail pieces as having higher positive response rates compared to digital, making them a great choice for creating a winning campaign. Political brochure printing isn’t just for elections either. Use brochures for any advocacy work or information campaign to not only spread your message, but to make sure it resonates with your audience. With the selection of options available, it’s easy to create brochures that fit and give credibility to any message.